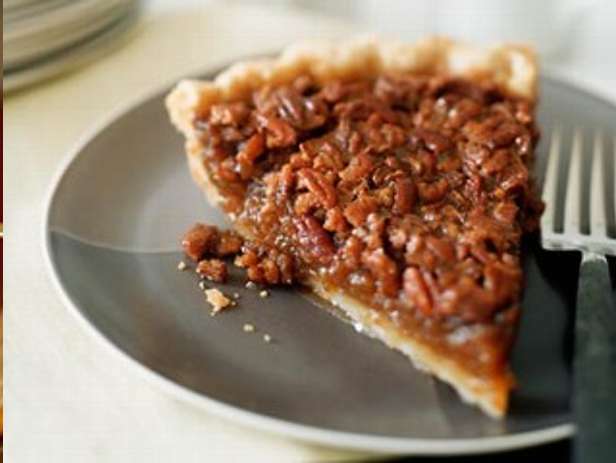 Spread the pecan pieces and the chocolate chips evenly on the bottom of the pie shell. In a mixing bowl, whisk the remaining ingredients together. Pour the filling over the pecans. Bake until the filling sets, 50 to 60 minutes. Remove from the oven and cool for 30 minutes before slicing. Cut into individual servings and serve with a drizzle of Caramel Sauce and sprinkle with confectioners’ sugar. Combine the sugar, water, and lemon juice in a medium heavy saucepan and cook over medium-high heat, stirring, until the sugar dissolves. Let boil without stirring until the mixture becomes a deep amber color, 2 to 3 minutes, watching closely so it doesn’t burn. Add the cream (be careful; it will bubble up), whisk to combine, and remove from the heat.